The spinal cord has two main functions. First, it is a center for spinal reflexes. Second, it is a conduit for nerve impulses to and from the brain. Nerve impulses follow nerve pathways as they travel through the nervous system. The simplest of these pathways, including only a few neurons, constitutes a reflex (re'fleks) arc. Reflex arcs carry out the simplest responses— reflexes. A reflex arc begins with a receptor (re-sep'tor) at the end of a sensory neuron. This neuron usually leads to several interneurons within the central nervous system, which serve as a processing center, or reflex center. Fibers from these interneurons may connect with in-terneurons in other parts of the nervous system. They also communicate with motor neurons, whose fibers pass outward from the central nervous system to effectors. (e-fek'torz) Reflexes whose arcs pass through the spinal cord are called spinal reflexes (fig. 11.7). Reflexes are automatic, subconscious responses to changes (stimuli) within or outside the body. They help maintain homeostasis by controlling many involuntary processes such as heart rate, breathing rate, blood pressure, and digestion. Reflexes also carry out the automatic actions of swallowing, sneezing, coughing, and vomiting. (a) A cross section of the spinal cord. 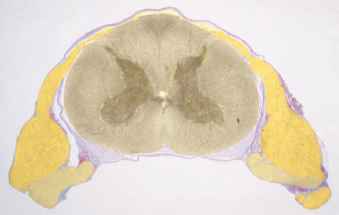 (b) Identify the parts of the spinal cord in this micrograph (7.5x). stimulating stretch receptors within the muscle group. These receptors, in turn, trigger impulses that pass along the peripheral process (axon, see fig. 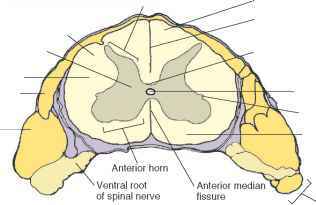 10.7) of a sensory neuron into the lumbar region of the spinal cord. 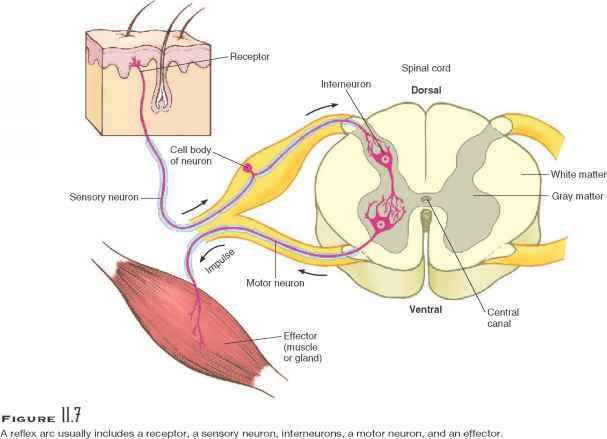 Within the spinal cord, the sensory axon synapses with a motor neuron. The impulse then continues along the axon of the motor neuron and travels back to the quadriceps femoris. The muscles respond by contracting, and the reflex is completed as the leg extends (fig. 11.8). The knee-jerk reflex helps maintain an upright posture. For example, if a person is standing still and the knee begins to bend in response to gravity, the quadriceps femoris is stretched, the reflex is triggered, and the leg straightens again. Adjustments within the stretch receptors themselves keep the reflex responsive at different muscle lengths. Another type of reflex, called a withdrawal reflex (fig. 11.9), occurs when a person touches something painful, as in stepping on a tack, activating skin receptors and sending sensory impulses to the spinal cord. There the impulses pass on to interneurons of a reflex center and are directed to motor neurons. The motor neurons transmit signals to the flexor muscles of the leg and thigh, which contract in response, pulling the foot away from the painful stimulus. At the same time, some of the incoming impulses stimulate interneurons that inhibit the action of the antagonistic extensor muscles (reciprocal innervation). This inhibition allows the flexor muscles to effectively withdraw the affected part. of the spinal cord that allow sensory impulses arriving on one side of the cord to pass across to the other side and produce an opposite effect (fig. 11.10). Concurrent with the withdrawal reflex, other in-terneurons in the spinal cord carry sensory impulses upward to the brain. The person becomes aware of the experience and may feel pain. A withdrawal reflex protects because it prevents or limits tissue damage when a body part touches something potentially harmful. Table 11.2 summarizes the components of a reflex arc. Clinical Application 11.2 discusses some familiar reflexes. H What is a nerve pathway? Describe a reflex arc. Define reflex. Describe the actions that occur during a withdrawal reflex. The nerve tracts of the spinal cord together with the spinal nerves provide a two-way communication sys tem between the brain and body parts outside the nervous system. The tracts that conduct sensory impulses to the brain are called ascending tracts; those that conduct motor impulses from the brain to motor neurons reaching muscles and glands are called descending tracts. These tracts are comprised of axons. Typically, all the axons within a given tract originate from neuron cell bodies located in the same part of the nervous system and end together in some other part. The names that identify nerve tracts often reflect these common origins and terminations. For example, a spinothalamic tract begins in the spinal cord and carries sensory impulses associated with the sensations of pain and touch to the thalamus of the brain (part of the diencephalon). A corti-cospinal tract originates in the cortex of the brain (the superficial portion of the cerebrum) and carries motor impulses downward through the spinal cord and spinal nerves. These impulses control skeletal muscle movements. The knee-jerk reflex involves two neurons—a sensory neuron and a motor neuron. It is an example of a monosynaptic reflex. A withdrawal reflex involves a sensory neuron, an interneuron, and a motor neuron. When the flexor muscle on one side is stimulated to contract in a withdrawal reflex, the extensor muscle on the opposite side also contracts. This helps to maintain balance. Which neuron makes quads contract? 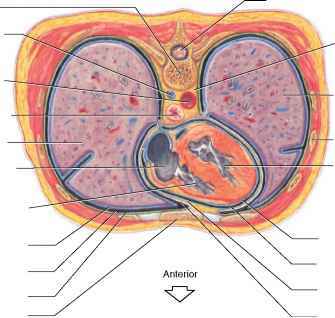 What is the posterior funiculus? Where is the reflex centre for sneezing? Where a sensory neuron, interneuron and motor neuron might be located within a human body? Why is the crossed extensor reflex important? What allows the brain and spinal cord to communicate with the sensory? Is he spinal cord considered a reflex center? What are the components and functions of a spinal nerve cord? How to unblock nerve pathways? What are the two main functions of the spinal cord?